Following in the footsteps of Bharti Airtel and Idea Cellular, Vodafone India is too rolling out aggressively-priced high-speed data plans to fend off competition from Reliance Jio. The ultimate beneficiaries, however, are consumers who are getting combo plans with more data and extended validity. 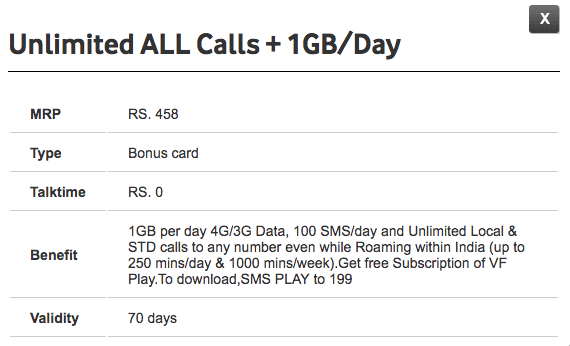 Vodafone’s popular packs range from Rs. 198 and to Rs. 349 and Rs. 509. Check out which plan is most suits your needs the most. Subscribers can head then head over to the MyVodafone app to check of these plans are available for them or not. 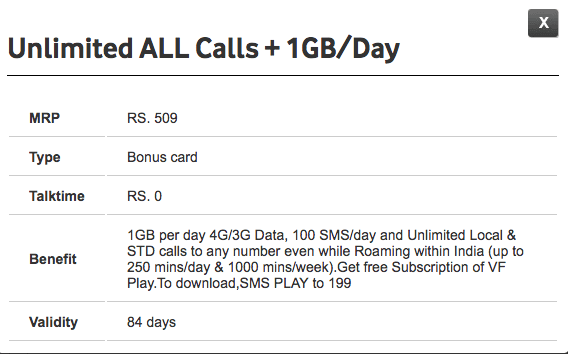 Following Airtel and Idea, Vodafone too has revised voice and data combo pack of Rs 349. The plan has now increased daily data limit from 1GB to 1.5 GB 4G/3G/2G/ data per day. It comes bundled with unlimited local and STD mobile and landline calls. This plan is valid for 28 days. Customers also get a free subscription to Vodafone PLAY app which streams TV channels and movies. This is, however, a limited period offer for all handsets, Vodafone said on its website. Under this recharge plan, Vodafone offers 1 GB 4G/3G/2G data per day, along with unlimited local and STD calls. The plan also offers outgoing national roaming and 100 SMS per day both local and roaming. The Rs. 458 Vodafone plan is valid for 70 days on all devices. This plan is similar to to the Rs. 458 plan but comes with a validity of 84 days. The Rs. 509 Vodafone recharge includes 1GB data per day, unlimited local and STD calls with free outgoing roaming and 100 SMSes per day. With this plan, you don’t have to worry about another recharge for almost 3 months. If you don’t have much data needs, Vodafone has another great plan for you. 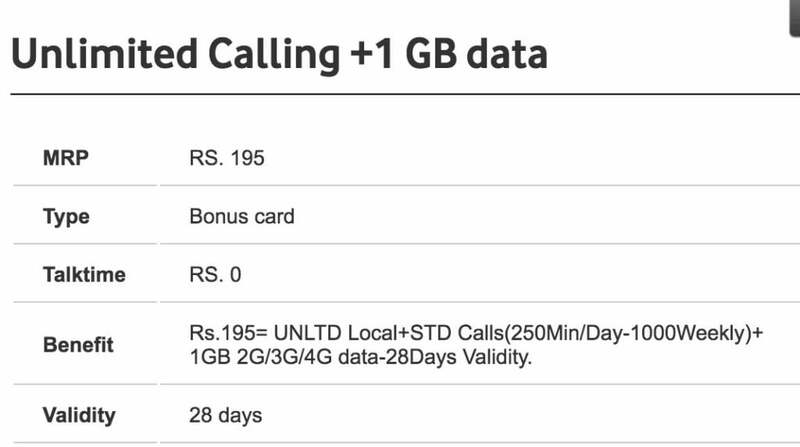 Bundled with just 1GB data, Rs 196 plan offers unlimited local and STD calls for 28 days. You wouldn’t get a cheaper plan than this. 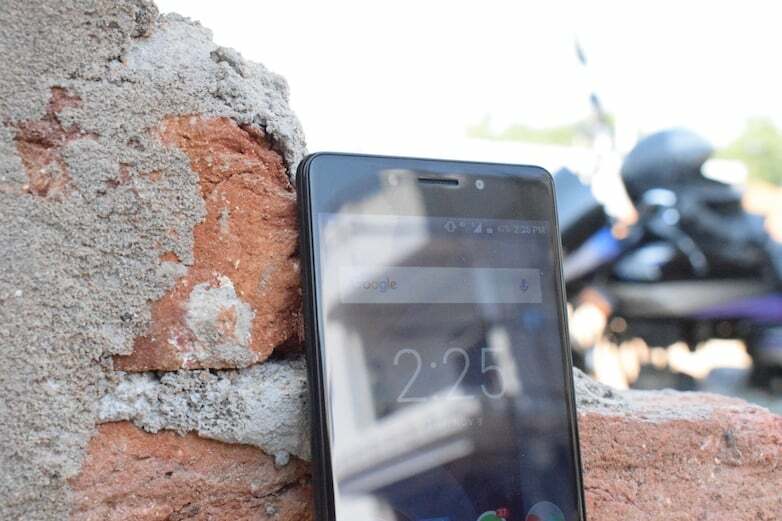 Vodafone launched a special voice and data plan for prepaid customers in Madhya Pradesh, Chhattisgarh, Bihar, Jharkhand, Andhra Pradesh and Telangana region. Priced at just Rs 38, this offer includes 100 local and STD calling minutes with 100 MB 3G/4G data for a period of 28 days. Vodafone has also announced new postpaid plans with unlimited calling and data offers. Basically, there are three plans bundled under the RED postpaid plan – Red Traveller, Red International, and Red Signature. The monthly rentals of Red Traveler plan start at Rs 499 per month and offer free data up to 200GB, free roaming and data rollover up to 200GB. You also get free access to latest movies and live TV using Vodafone Play, 12 months free subscription of Netflix, and access to handset theft and damage protection with Red shield. These plans are for postpaid users only. Xiaomi Redmi Y1 vs Asus Zenfone 4 Selfie (ZB553KL): The Battle for Best Budget Selfie Smartphone! So my dear vodafone plz bring your plans down as i am your very old customer and i have vodafone number registered as official use but frankly i do use jio for calling and internet. Fantastic – With these plans & Vodafone’s excellent service , I’ll be a very happy prepaid customer – always been happy but with 458, 509 for Mumbai, I’m more than happy, especially since they have included 100 free sms’es even while roaming. 10/10 ! I am shifting two people from Airtel to Vodafone very soon. Thank you, Vodafone Mumbai !